North to South Interconnect was a project to connect North and South facilities with a 1066 foot 14 inch bore under the Colorado River and I-70. 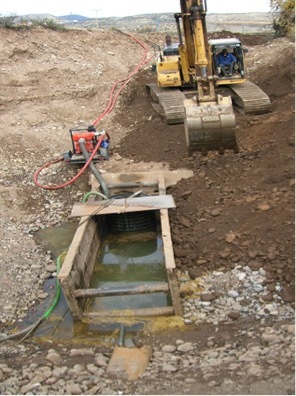 This was emergency work based on the fact that the North sewer facility was over capacity and the State of Colorado demanded that the two facilities be connected. In addition to the bore, 2800 feet of gravity sewer and a lift station allowing effluent to be pumped in both directions was installed. The bore component of this project was a design build by Gould construction and the engineer of record for designing the alignment and profile.